it was revealed today, on November 13, at about 6:17 pm on MLB Network, that Michael Brantley finished in 3rd place for Baseball Writers' Association of America's 2014 American League Most Valuable Player Award! this has to be my most favorite offseason career first of them all of his. 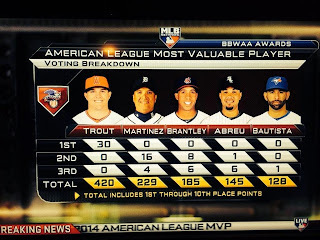 **BBWAA made an error in the initial tabulations that were showed on TV during the live show and posted on their website. 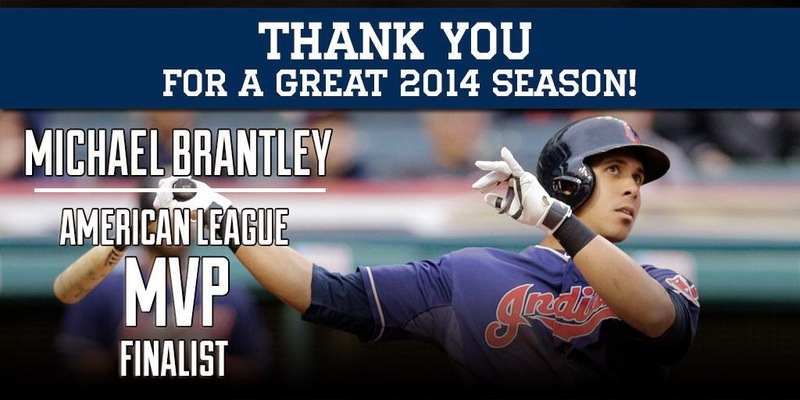 it was corrected about an hour later online, taking one 5th place vote away from Bautista and rightfully giving it to Brantley. that pushed Bautista down to 6th place overall and moved Cano up to 5th. the chart included below is accurate. as expected, the AL MVP winner this year is Mike Trout, with his .287 batting average and 184 strikeouts lol =P i kid, i kid. however, he is the first position player to win this award for a season in which he had a higher number of strikeouts than hits (173). 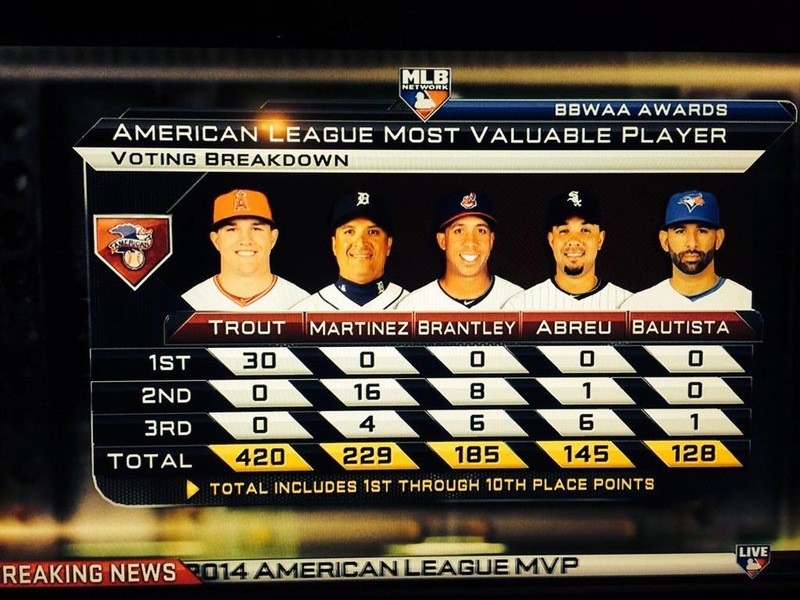 Trout won in a unanimous vote. the 2 voters from Cleveland were Paul Hoynes of The Plain Dealer and Chris Assenheimer of The Chronicle-Telegram. 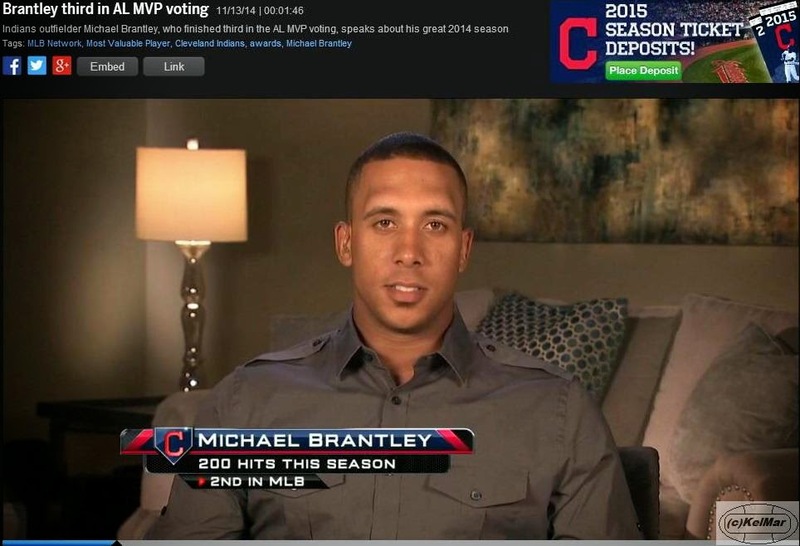 while Hoynsie gave Michael a 3rd place vote, Chris decided that Michael's season was good enough for a 2nd place vote. all the individual ballots can be found here, and it's worth a look. Michael was named an MVP finalist along with Trout and Victor Martinez on November 4 and he briefly spoke about it in an interview on November 7. "really, it's just an honor to be mentioned. that's not something you take lightly. it's a lot of hard work. obviously, your peers and voters and everybody have their say as well. i'm just honored to be mentioned in that category of guys that i'm in. i just think it's a good tribute to a lot of hard work paying off." 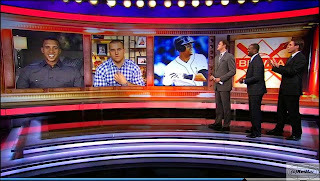 today the finalists had a chance to say a few words on MLB Network's award show before the MVP was announced. 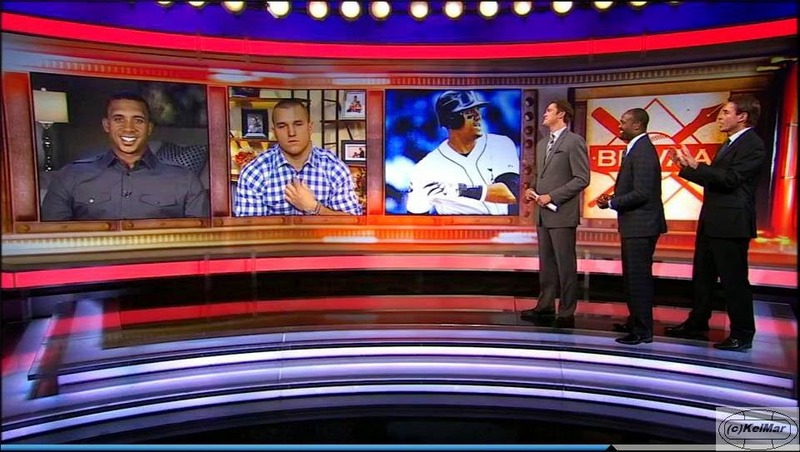 (no, Victor Martinez was not there.) Michael's interview is here. on his move from leadoff man to 3 hole slugger: "in the beginning of my career, that's all i knew, was how to hit leadoff, how to set the tone, get on base for my teammates. and now hitting in the 3 hole, it's about driving in runs, getting a good pitch early and trying to get that guy in from 2nd or 1st or wherever he's at, 3rd base, and do the best you can for your team." 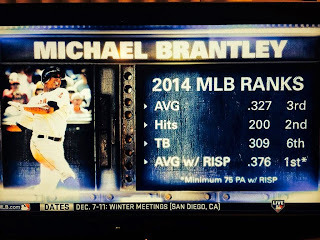 on how he's evolved against left-handed pitchers as a left-handed hitter: "just really trying to stay on the ball. and doing a lot of homework. the best thing about being in the major leagues is that you have a chance to, you know, have scouting reports and do video work and try to figure out what they're gonna do to you. left-handed pitchers are not easy, especially when you don't see them as much and especially how good they are on the major league level. so i just try to get a good pitch, put a good swing on it, and then whatever happens from there happens." how important is it for him to put the ball in play? "well, it's very important. the more times you put the ball in play, the better chance you're gonna get a hit. it's no secret. it's not always easy. major league arms, they're just getting better and better. guys are throwing harder, better out pitches. 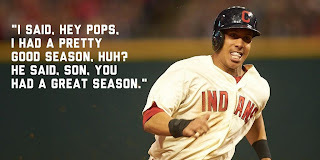 you just gotta come to the park every day prepared and do the best you can for your team." Michael also spoke with the Cleveland media after the MVP special concluded. here is some of what he had to say. "this game is team-oriented and as long as you keep thinking like that, it keeps you motivated to keep playing hard and always working to get better." 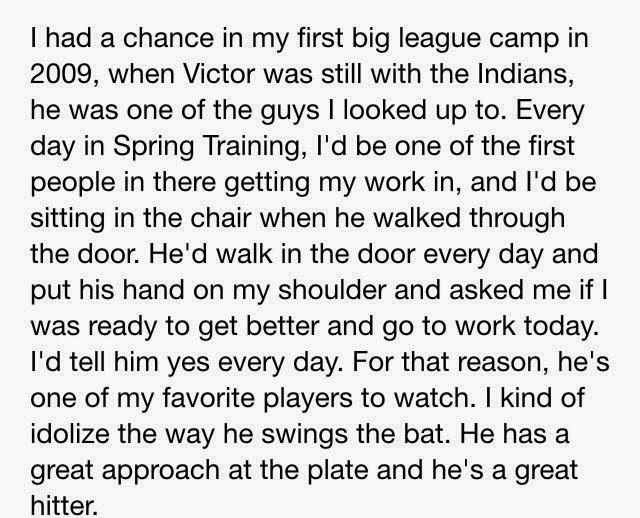 "the day before i left for spring training, my father sat me down and asked me to do something. he said, 'i want you to get ready to hit every pitch.' that means from the first time i stepped in the batter's box, the first pitch the pitcher threw to me, that i was ready to hit. my father told me, 'listen son, your numbers will not go down, they'll go up.' i thought if i swung at the first pitch more often, i'd get out more often because i'd never done it before. he's been trying to get me to do it for the last few years, but i never bought into it. i had that leadoff hitter mentality. this year i told him i'd accept the challenge and try it in spring training. the key word was try. in years past, i hit like a leadoff hitter. i wanted to make sure i got a perfect pitch. i wanted to make sure that i had, you know, a deep at bat, make sure i saw some pitches. this year, if i got a first pitch fastball early, i put a good swing on it, i didn't care where it went. it worked for me in spring training, so i decided to keep that mentality during the season and it worked out." "i want to improve in every category. i want to strike out less. i want to make more plays defensively. i want to do whatever i can to help the team get farther." "when your teammates start respecting how hard you work, respecting how you carry yourself, respecting how, you know, you care for one another on the field, and they see that, i believe that everybody kind of draws to you or wants to talk to you or kind of leans on you. me personally, i just go out there and try to lead by example. i don't say too much, i'm kind of quiet, but i play hard each and every day. i try to be the best teammate and pick up my teammate when he's down or who needs help, and they do the same for me." 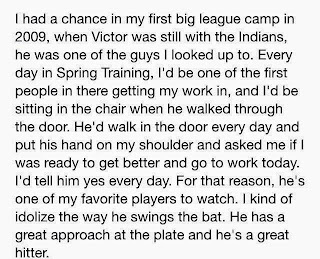 this full interview, including some of his thoughts about CyKluber, can be found here. 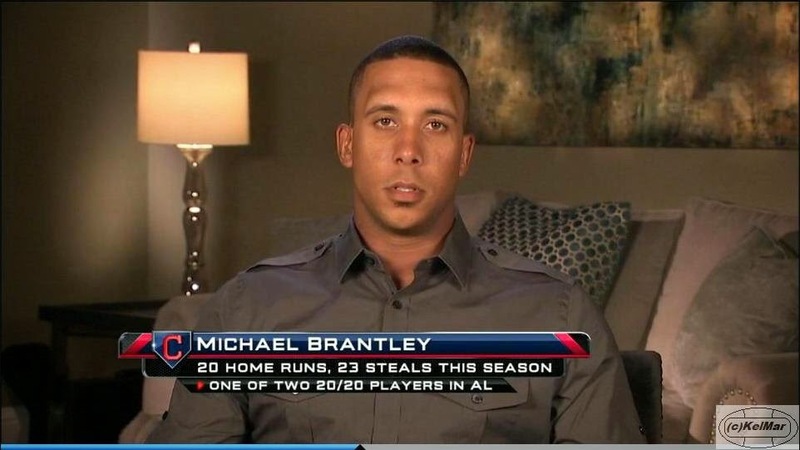 i agree with what Michael said after he learned he was a finalist, about being honored to be in this position. this is one of those times where it truly is just an honor to be nominated. no doubt Michael had the numbers to win MVP this season but there is no animosity from me here about him placing 3rd. that's outstanding and this recognition is very deserved. he's such a selfless player, always putting the team first no matter what and without complaint. 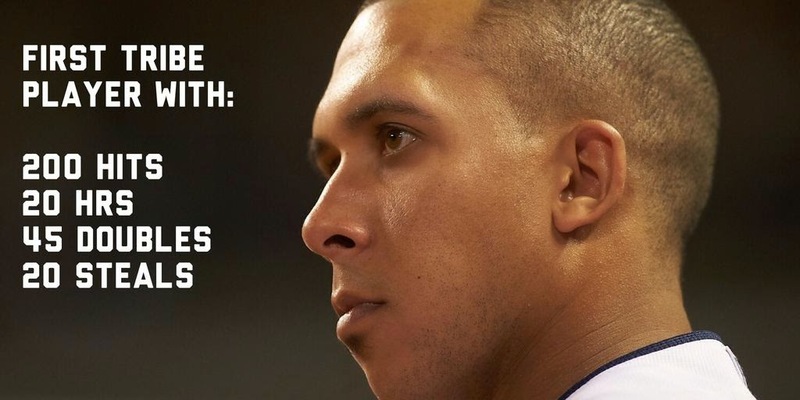 his leadership and work ethic are invaluable to all the players on the team, especially the young kids. much like Michael's consistency on the field, he prepares the same way each and every day and he trains so hard. 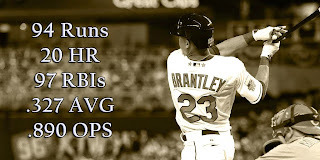 hopefully one day all his relentless work will result in an MVP award.